Photo: Kamrul Hasan Khan/IRIN. Sending "death squads" on peacekeeping? BANGKOK, 29 July 2014 (IRIN) - Reports on Bangladesh, India, Nepal, and Nigeria released in July 2014 at the Open Society Institute in New York reveal failures in human rights vetting for soldiers in countries that contribute to UN peacekeeping operations. “These are four of the top seven troop-contributing countries in the world, so their policies and practices on the ground are important to what happens when people are deployed in the field,” said Jerry Fowler, senior policy analyst at Open Society Policy Center. There are currently more than 82,000 troops deployed on UN peacekeeping missions around the world. Vetting has been formalized recently. In 2012 the UN passed a human rights screening policy requiring that both troop-contributing governments and individual recruits attest to clean records as part of the onboarding process. However, some of the countries supplying the largest contingents of troops to UN missions are renowned for poor human rights records, and their armed forces have been involved in years of domestic counter-insurgency efforts. Officials say cleaning up the supply of troops to peacekeeping deployments is under way, and activists call for stringent monitoring and enforcement from the top down to put pressure on governments that benefit financially from putting their soldiers in UN uniforms. Experts say much of the pressure to improve vetting will need to begin at home. In March 2011, Lemon Hossen, 16, was walking to retrieve his family’s cows in Bangladesh’s southern Jhalokathi District when motorcycles carrying Rapid Action Battalion (RAB) officers pulled up beside him. One grabbed him and called him a terrorist. RAB officers are among those recruited into UN peacekeeping missions. On 17 February 2004, Maina Sunuwar, 15, was arrested by Royal Nepal Army officers and tortured and killed at a facility used to train peacekeeping troops. That same year a Nepali court charged Army General Niranjan Basnet and three officers under his command with Sunuwar’s murder. The UN expelled Basnet from his post on a peacekeeping mission in Chad in 2009. However, analysts argued that the case, while technically resolved on the UN’s part, indicated systematic issues. “The UN has lost credibility as its core values have been marginalized… With no systematic vetting of peacekeeping troops by either the government or the UN, even high-profile alleged abusers have been deployed in lucrative posts in UN missions,” the International Crisis Group argued in a 2010 Nepal report. “If UN troops have a track record of aggressive counter-insurgency tactics at home, they may be liable to turn a blind eye - or even assist - equally tough tactics against rebel groups and militias while on peacekeeping duty,” explained Richard Gowan, associate director at New York University’s Centre on International Cooperation. “The fact that UN personnel have troubling records of brutal counter-insurgency at home is especially worrying because in many countries, such as Mali and the DRC [Democratic Republic of Congo], UN peace operations are blurring into counter-insurgency missions themselves,” he said. Suhas Chakma, director of the Delhi-based Asian Centre for Human Rights (ACHR) and author of the peacekeeper vetting report on India, decried the peacekeeper selection process, explaining that troops involved in India’s various counter-insurgency operations - from Jammu and Kashmir to the Naxalite Maoist insurgency that has plagued parts of the country since the late 1960s - are often popular candidates. “When you have to prove yourself in one of the country’s ‘extremely difficult areas’ in order to get picked for a peacekeeping mission, then it’s a selection process that favours those who have already been deployed in situations rife with human rights abuses,” Chakma said. 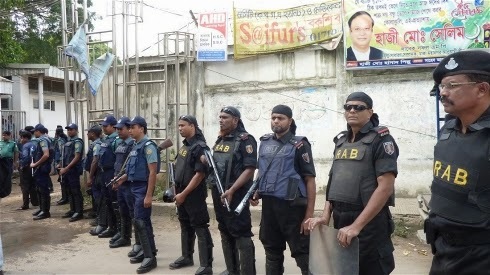 ACHR’s report on Bangladesh, Sending Death Squads to Keep the UN’s Peace, explained that RAB officers, even though they are drawn from Bangladesh’s other security forces, are still eligible for peacekeeper recruitment. Blue helmet selection in Bangladesh has sparked violence of its own. In 2009, 74 people, including 57 army officers, were killed when members of the Bangladesh Border Guard mutinied in part over their exclusion from the peacekeeper recruitment process. According to Gowan, the desires and incentives involved in peacekeeping deployment can influence not only the politics of vetting at home, but performance abroad. “If a blue helmet deployment is seen as a ‘reward’ for troops who have undertaken high-intensity counter-insurgency operations… those personnel are naturally not going to put their lives on the line in the service of the UN,” he explained, gesturing at a 2014 report by the UN Office of Internal Oversight Services which found that peacekeeping troops often failed to use force to protect civilians. “There's a risk that peacekeeping turns into a sort of military vacation scheme,” Gowan said. UN pressure may not be sufficient, however. “UN officials lack the power to censure troop contributors effectively, especially as the demand for peacekeepers is so high at present. Real pressure for change has to come from domestic groups,” said Gowan, who argued in a Chatham House essay that peacekeepers are “thinly spread, poorly resourced and sometimes undisciplined but they make the best of a foul job”. “The UN does not have the capacity to vet [every soldier] itself, though it can respond to allegations that have come its way,” explained Ferstman. According to ACHR’s Chakma, transparent recruitment processes could align all of the actors.